•Check Link type and click OK. Progress can be followed in the status bar. 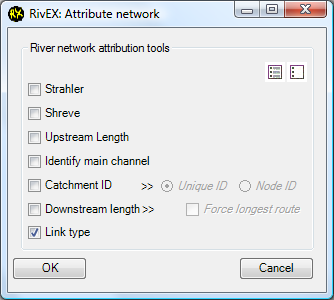 •Analyses of river networks often describe the type of link a river reach represents. These are typically Interior, Exterior and Outlet. 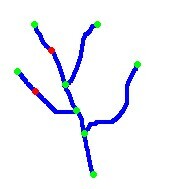 Different river patterns will have different ratios of these link types. •The output of this process is a single text field called Link_Type containing either I for Interior, E for Exterior or O for Outlet. •This process is influenced by the presence of pseudo nodes within the network. They will give a false impression on the number of types of links present in the network. Pseudo nodes must be removed before processing the network for link type. •Below is a series of images that explain how pseudo nodes affect the link type. Displaying the same network with the nodes visible. 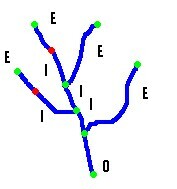 Red nodes are pseudo nodes. 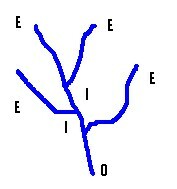 The addition of the pseudo nodes means there are 2 new interior links and what were exterior links now do not reach the confluence. •Before you remove the pseudo node consider why it was there in the first place? Is it a product of the way your data was collected? Do their presence mark the location of a boundary, for example a lakes edge? If so you would expect to see a pseudo node marking the outflow of the lake. 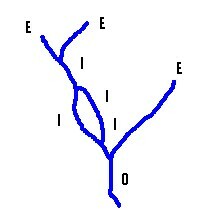 •A single polyline representing a small stream will be classified as an Exterior link.